Even among Christians the season of Advent seems to get skipped over. Sometimes in our eagerness to defend against a culture war “Christmas” we do ourselves more harm than good, because we lose sight of the peace that Advent gives. At Faith this year, we’re trying something new: a “DIY Advent Kit.” It is a kit designed to bring Advent back into the home. 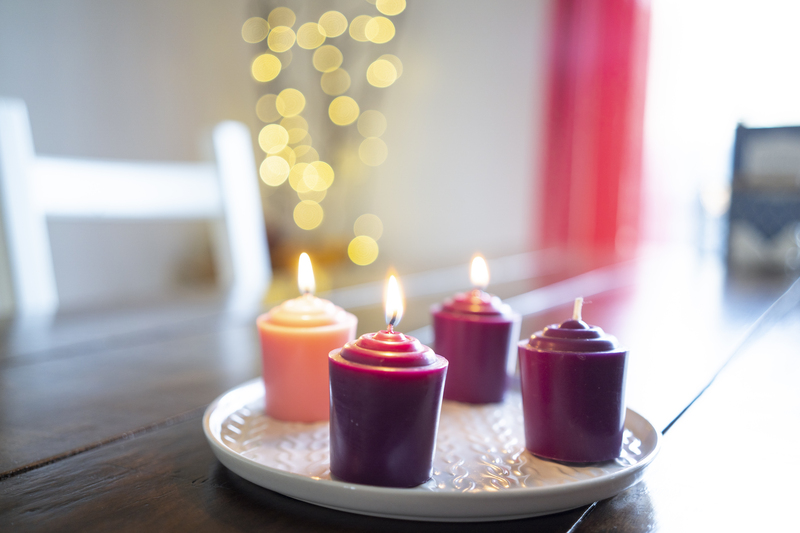 The Advent Wreath (typically 3 purple/violet candles and 1 pink/rose candle) was a tradition that originated in the home. Only in recent centuries did it find its way into churches. And when the church took it in, like many other things, it came out of the home. Each of our kits includes 4 small candles. Our family used these candles last year, lighting them as we did our devotion after dinner each night, and the candles lasted the entire season (We just found them again and used what was left to light our church centennial themed pumpkins for All Saints Eve!). A simple way to display and arrange your Advent candles. A new candle is lit each week of Advent. The pink (rose) candle is lit during the third week. In addition, each book contains activities for families based on the “O Antiphons” as well as recitations for families to go along with our Children’s (Pre-)Christmas Program. Despite department stores playing the Christmas favorites immediately after Halloween, the Christmas season doesn’t start until the night of December 24 and lasts for 12 days. The music of Advent is different than Christmas. Some beautiful music has been all but forgotten. Rather than listening to ‘Rudolph’ ad nauseam, slow down and enjoy the music of Advent. Here is an Advent Spotify Playlist curated specifically for families at home. Below are chief hymns for each of the weeks of Advent.